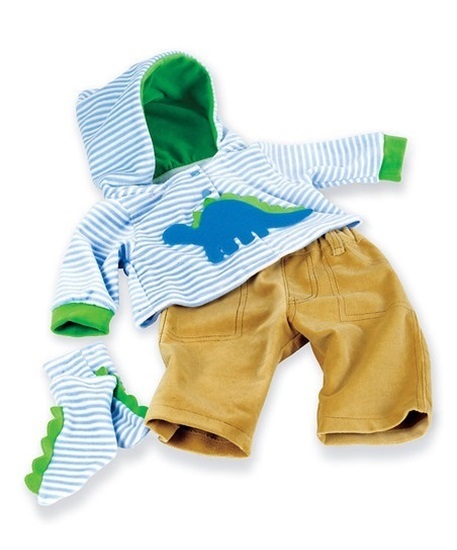 This is a dinosaur-themed outfit with a large dinosaur applicaed on the front from the long-sleeved blue and white hooded top, tan pants and dinosaur slippers. This is an adorable outfit designed to fit the Middleton Newborn Nursery baby dolls as well as many other 18-20 inch baby dolls, including the Adora Toddler dolls. It consists of a long-sleeved blue and white striped top with a large dinosaur appliqued on the front and an attached hoodie. Tan pants and dinosaur slippers are also included. These cuddly soft pajamas will fit most 19-20 inch baby dolls.